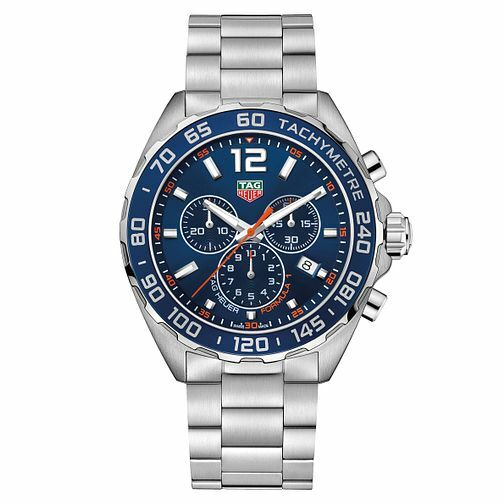 From TAG Heuer's technologically advanced Formula 1 collection, comes this enticing stainless steel bracelet watch with chronograph, blue dial and date window, along with a blue tachymeter bezel. A bold, sporty timepiece, designed to deliver supreme reliability, inspired by the Mclaren Formula 1 team. TAG Heuer Formula 1 Men's Stainless Steel Bracelet Watch is rated 5.0 out of 5 by 7. Rated 5 out of 5 by Anonymous from Great features I brought this watch for my husband . The detail in the watch is precise it's very stylish and stands out! Rated 5 out of 5 by Anonymous from Husband very pleased, however strap too big, where can I get strap made smaller, within London .